UPDATE (8/10/18) – Since I posted this information, Dr. Clinton or someone acting for him has deleted most of the articles referred to below. Archived copies of those articles exist and I have added links to them below. The post has been edited to reflect those changes. Via Twitter, I asked Clinton for comment without reply as yet. While it is appropriate to remove content, it would be right to comment and take responsibility as well. Sources continue to send other instances of Clinton’s web articles where information from other authors is used without citation. I plan to add them to this post as I find them. Check the end of the post and this link for additions. Family Talk Radio is also removing posts with borrowed material. Oh my, you can find bad history in the strangest places. Knowing my interest in historical claims, a colleague pointed out this historical faux pas in an article by Tim Clinton (also at James Dobson’s website), president and owner of the American Association of Christian Counselors. Dr. Clinton is also an advisor to President Trump. Making this article of double interest is the lack of citation of the historical problem which is a problem according to the doctor’s own ethics code (1-880). In all, 5 of the 56 were captured and tortured by the British. 29 had their homes, businesses and property destroyed and eventually went bankrupt. Several lived off charity and died penniless. 9 were killed in the Revolution. 2 lost sons. This information is lifted without citation from various sources (e.g., here). Much of it is inaccurate and exaggerated as documented by these pieces at Snopes and the Daily Signal. Dr. Clinton, which 9 were killed in the Revolution (implying they died in war)? As of 8/13/18, Celebrate Freedom has been removed. This isn’t the first time for Dr. Clinton. Just yesterday, Dr. Clinton was called out by psychology professor Aaron New on Twitter about a piece posted on Medium.com. Here is that Twitter exchange. In question was an August 7 article posted by Clinton on Medium about the 1980 USA Hockey team. After Dr. New pointed out the similarities between Clinton’s article and a 1999 article about the team’s win over the Soviet Union, Clinton deleted the tweet and the article from Medium and AACC. Here is the archived copy of the original St. Petersburg Times article by Bruce Lowitt. The articles use very similar words and phrases. Here are some examples. Lowitt: At the start of the 1980 Winter Olympics in Lake Placid, N.Y., the U.S. team was, like its gold-medal predecessor, little more than an afterthought — even in the mind of its coach. Clinton: At the start of the 1980 Winter Olympics in Lake Placid, N.Y., the U.S. hockey team was little more than an afterthought. Lowitt: The Soviets were seeded No. 1, and deservedly so. They had won five gold medals and one bronze in the previous six Olympics. The seventh-seeded U.S. team could cling to one piece of history. Clinton: The Soviets were seeded №1, and deservedly so. They had won five gold medals and one bronze in the previous six Olympics. The U.S. team was seeded seventh. Lowitt: The Soviets unleashed 30 shots in the first two periods to the United States’ 10. Only one dramatic save after another by former Boston University goaltender Jim Craig kept the United States close. Clinton: The Soviets unleashed 30 shots in the first two periods to the United States’ 10. One dramatic save after another by goaltender Jim Craig kept the U.S. team close. Lowitt: The explosion of cheers was deafening, and most of the 10,000 fans squeezed into the 8,500-seat arena began a chant of “USA! USA!” that never abated in the final 10 minutes. Clinton: The explosion of cheers was deafening, and most of the 10,000 fans began a chant of “USA! USA!” that did not end for the final 10 minutes. The quotes from the players in Clinton’s article were the same as in the Lowitt article although shortened. Read both pieces and decide for yourself. This article is also in his book with Max Davis titled, Ignite Your Faith, and under another title at James Dobson’s Family Talk website. Dr. Clinton should also check in on this article titled “Do” since it has material taken from this article on a history website without citation. Update (later the same day): Now this article titled, “Do” has been removed from the AACC website without comment. The article is still archived here. UPDATE: Clinton has removed all articles and apparently removed his account from Medium.com. An archived version of the page can be viewed but in real time, it is gone as of today. UPDATE: See the comments section for three more examples provided by Dr. New. Here’s one from this article on the AACC website called “How About Some Respect.” The Wikipedia entry is an early version which was in turn adapted and used on LastFM. (8/10/18) “How About Some Respect” has now been removed from the AACC website. However, it is available at the Internet Archive. (8/10/18) Clinton also removed an article from both the AACC and Medium websites titled “Bounce Back.” Professor New referred to this piece in the blog comments section. This article is also available at the Internet Archive. There is no mention of Ev Worthington on the page. 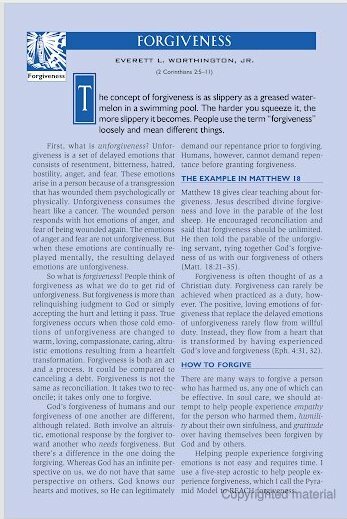 However, here is Worthington’s entry on forgiveness in the Soul Care Bible. Clinton also has reproduced articles on adultery, honor, crisis, hope, parenting, suicide, divorce, addiction, legalism, and adolescent development on his page. None of these articles on Clinton’s website list the actual author. “Splagchnizomai” the Greek word for compassion literally means “to be moved as to one’s bowels” (for the bowels were thought to be the seat of love and pity). σπλαγχνίζομαι; 1 aorist ἐσπλαγχνίσθην (cf. Buttmann, 52 (45)); (σπλάγχνον, which see); properly, to be moved as to one’s bowels, hence, to be moved with compassion, have compassion (for the bowels were thought to be the seat of love and pity). According to the code of conduct of Clinton’s former academic employer Liberty University (any writer or academic knows this), any direct quote should be cited and placed within quotes. In a devotional piece such as the one on the AACC website (although it is supposed to be a professional organization), a footnote could be used to give proper attribution. Although this might seem like a small instance, it is completely unnecessary. There is no reason why the use of the exact words from Thayer’s reference work can’t be cited as it should be. Off and on through the afternoon of 8/10 timclinton.com has been down. There have been shifts in content through the day as well. However, no response has yet come to my inquiry. Image: Johnnie Moore’s Twitter feed, Jul 11, 2017. 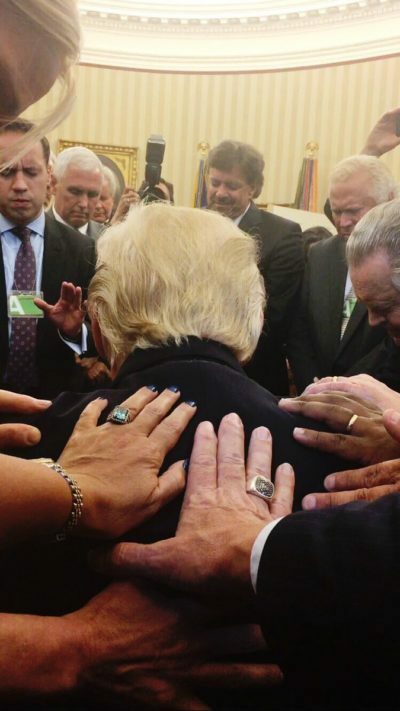 (In error in this and other posts, I attributed the photo to a YouTube screen capture, I have corrected that error in all posts where the fair use of this photo occurs). Next Next post: James Dobson and Family Talk: Who Really Wrote These Articles?